Popular perception is that Robert De Niro has been coasting, phoning it in, since his 1995 double of Michael Mann’s Heat and Scorsese’s Casino. Looking at the filmography it’s difficult to argue and I doubt that this self-satisfied Hollywood insider story will change any minds. 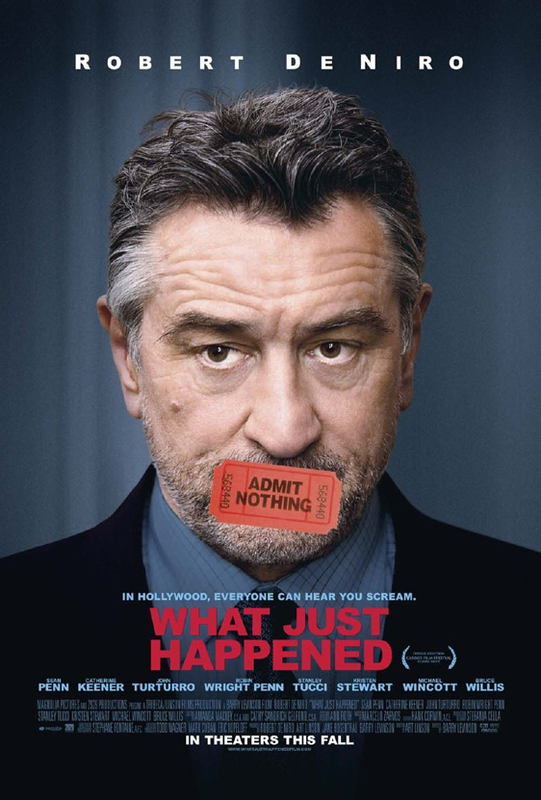 De Niro is Ben, a movie producer with a series of problems to deal with. His latest release is test screening abysmally due to a dog being shot but the director wants to keep the ‘dark edge’ and his film due to start production starring Bruce Willis is halted when big Bruce decides he wants to keep his ‘Grizzly Adams’ beard. The beard issue is based on the story that Alec Baldwin refused to shave his beard during production of The Edge for fear that he would look fat. It’s this sort of mild scandal that if you were a regular reader of Variety you may find wryly amusing in What Just Happened. Unfortunately this is no scathing insight into the Hollywood dream machine, it’s a cheeky glimpse. The drama isn’t dramatic and the comedy is underwhelming. If you’re thinking of watching this film – don’t. Instead find a copy of Robert Altman’s brilliant The Player, a much more involved and brave film.